“Can I get a witness?” That’s what watching Netflix’s Daredevil was like for me. Not just a mesmerizing bit of eye candy a la Banshee, Game of Thrones, or Scandal, but a real, honest-to-goodness parable of good versus evil, of motivations, of the tearing down and building up of the human condition. This is not just a superhero jaunt, the latest in Marvel/Disney’s threat to take over the known world of entertainment. This is the story of two men, and their quest to control Hell’s Kitchen, one way or another. Fans of Daredevil, like this one, have been waiting eagerly to see what Marvel would do on Netflix with the promise of a Jessica Jones, Luke Cage, Iron Fist, and The Defenders package that will accompany this one. Would our blind, masked hero be more Mark Waid or Frank Miller? Would Brian Michael Bendis or Ed Brubaker be proud? 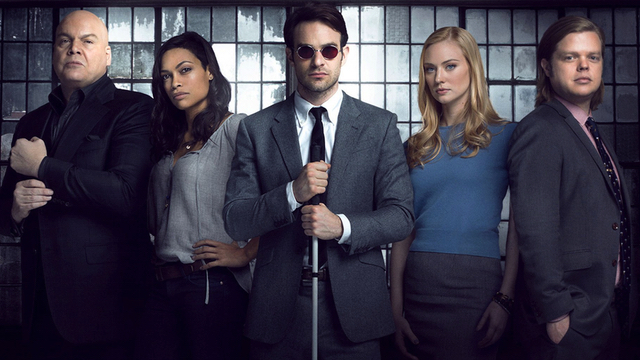 Would Netflix’s version stay true to what we knew of Karen Page, Foggy Nelson, and the Kingpin? Would the series be able to make us forget the ill-fated Ben Affleck/Colin Farrell tête–à–tête? 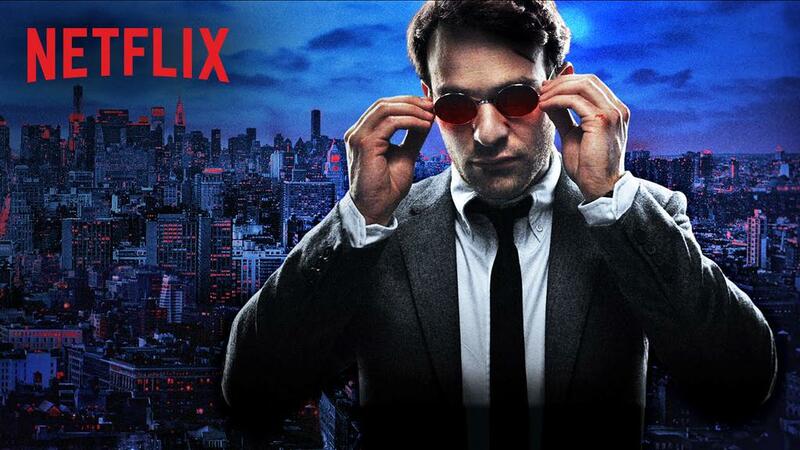 Charlie Cox plays Matt Murdock, lawyer by day and man without fear by night, with aplomb. He’s a Murdock: rarely the outright winner but the guy who always gets back up. We see and understand his background (thank goodness we had no FOX Amazing Spider-man-like messing with the origin there), and he’s a realistic fighter who gets bloodied, gets tired, and refuses to stay down. He’s not Superman, not even Batman with impressive body armor. He’s a dude in a mask who has heeded the call to defend his city. For the record, the most common comparison that came to mind was Batman Begins. Murdock has his Ra’s al Ghul in Stick (Scott Glenn); his nefarious background with a group of assassins, The Hand; an alluded-to girlfriend (Elektra! ); and a growing sense of what it means to be the hero of a city that doesn’t fully respect you. But the film, er, thirteen-episode cinematic television masterpiece, reminds me of The Dark Knight, too, because Murdock’s arch nemesis helps define who he is. I cannot lavish enough praise on my man, Vincent D’onofrio, as Wilson Fisk AKA The Kingpin. I’ve loved his stuff since Law & Order: Criminal Intent, and film roles like his big brother spot in last year’s The Judge. But here, any viewer of the Kingpin origin episode can tell you, D’onofrio plays the one-time enemy of Spiderman and the Daredevil with such bottled aggression, simmering to explode, excellently. I don’t intend to drop major spoilers, but the Kingpin on Netflix is much less black and white (no pun intended, Michael Clarke Duncan), and much more wounded, misguided soul. Both Murdock and Fisk both think they’re doing what’s best for the city. Both of them have taken risks and roads less traveled. Both of them judge themselves and approve themselves, moment-by-moment. It’s grey, and complicated, and beautiful. Murdock seeks the advice of a priest, while Fisk says he’s not a religious man. But it’s Fisk’s use of the Parable of the Good Samaritan in the final episode that ties together the ways that both of them have alluded to a struggle with God’s purposes. Are they forces of good, the defender of the innocent in the parable, or are they malcontents seeking excuses for fisticuffs and anger, like a spirit of violence? We know the answer because this is hero television, but Daredevil has always been complicated, and Netflix’s portrayal is no different. It’s hard not to like Cox’s Murdock. He’s feisty, yet humble, angry, yet cool under fire. He can fight the heck out of a hallway, and growl lines that would make Christian Bale cower in shame. And he portrays Murdock in a way that makes us think that blind is the new cool, not a handicap or something to be looked down on. The fact that Netflix is making the show watchable for the blind, and mixes in real Spanish and Mandarin Chinese shows that they’re seeking a big picture that others can’t see. Which may actually be the biggest point of the show. Murdock can see what others can’t. He has vision when others are questing after revenge or power or security. He rallies others like Page, Nelson, and fearless Ben Urich to the cause. He can hear your heartbeat and judge your truth. He won’t judge you, but he will pursue peace for the city of Hell’s Kitchen, even if he’s got to put his flesh and blood on the line to get it. What are you waiting for? You should already be watching. This entry was posted in Comics, Interviews, Pop Culture, Reviews, Theology, TV and tagged Charlie Cox, daredevil, Foggy Nelson, Hell's Kitchen, Kingpin, Scott Glenn, Vincent D'Onofrio, Wilson Fisk. Bookmark the permalink.